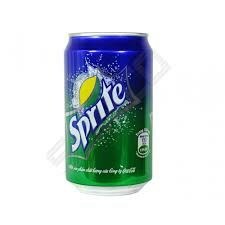 Sprite is a colourless, lemon-lime flavoured, caffeine-free soft drink, created by the Coca-Cola Company. It was introduced in the United States in 1961. This was Coke's response to the popularity of 7 Up. It comes in a primarily silver, green, and blue can or a green transparent bottle with a primarily green and blue label.